my boss drives me crazy sometimes. he had me near tears right before lunch today. but, alas, i have nothing but a NSV to report. on lunch, the crew and i went to carytown and i bought some new workout shoes. goodbye $135 nike shox, hello $95 saucony. my feet better thank me tonight. also - i got an awesome deal on a vera bradley duffel bag....well, 2 of 'em. 50% off, fools. :) needed some weekend bags - all of my luggage got lost in the divorce. what is that? aims journaling her food?! YES! this is the bulk of my lunch. 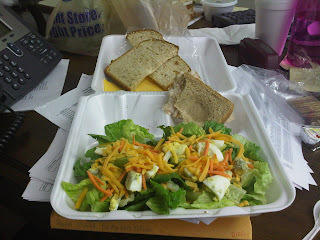 a big ol' salad (i even added carrots to my usual "just lettuce") with FF italian dressing and a turkey sandwich. please note that i removed the turkey and cheese from the high calorie bread the cafeteria served and put it on my "2 slices for 1 pt" bread. i kept 1/2 a slice of cheese on it, and tossed the rest out with that other bread. the bread on the back of the container is what i tossed out. dinner is planned and within my points. happy day! And yay for the vera deals! 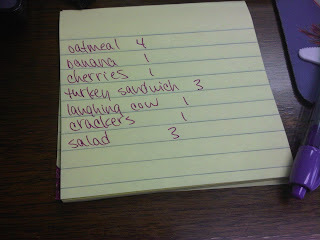 Kudos on the food journaling aaaaaand *high fives* to that nsv! :D good for you, missus!